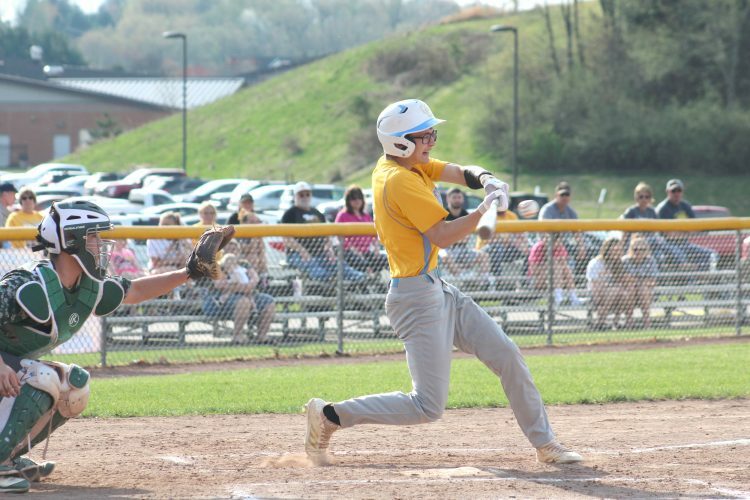 STRUTHERS–The Beaver Local baseball team rallied from an eight-run deficit to earn a wild 15-14 eight-inning win over Struthers Saturday at Cene Park. The Beavers are now 2-8 overall. Beaver Local trailed 9-1 going into the fifth. The Beavers forced extra innings with two runs in the fifth, five in the sixth and six in the seventh. Ethan Stephenson brought home the go-ahead run with a bases-loaded walk in the eighth. Hunter Saltsman led the Beavers with three hits and two RBIs. Dorian Jackson and Avery Wiegand each had two hits and two RBIs. The Beavers host Salem Monday. BL–Jordan Mick (3IP, 1K, 2BB), Ryan Cunningham, wp, (5IP, 3K, 1BB) and Carter Wolski. ST–Laczko (5IP, 3K, 2BB), Tomko (1IP, 3K, 1BB), Moaco, lp, (2IP, 3K, 6BB) and Clemente. MINERVA–The Lisbon baseball team established an early six run lead and held off a late rally by Minerva for a 7-6 victory Saturday. Nick Mundy had two hits and two RBIs for the Blue Devils (5-6). Logan Bell added a triple and an RBI as well as earning the win with three scoreless innings. Blake Reynolds had a double and an RBI, while Garrett Cox had two singles and an RBI and Tyler Toot had two singles. RICHMOND — Brennan Scott lifted the Edison baseball team with a walk-off single to lift his team to a 5-4 victory over defending Div. III state champion South Range on Saturday. Scott finished with a pair of singles overall. George Ash shined on the mound and at the plate. He singled twice and drove home a run, while picking up the victory in the complete-game effort, with five walks and three strikeouts. Ryan Higgs had two RBIs, while Andrew Kinney doubled. Anthony Sinicropi tripled and walked twice. Alec McBane also tripled. Trey Pancake and Jared Bajerski had two hits each for the Raiders. ED–Ash (wp, CG, 4R (2ER), 7H, 5BB, 3K) and Gump. SR–Mikos (5IP, 4R, 7H, 4BB, 4K), Shannon (lp, 1 1/3IP, 1R, 2H, 1BB, 1K) and Pancake. CALCUTTA–The Beaver Local softball team dropped both games of a doubleheader against Bellaire Saturday. The Beavers lost the first game 6-2. Cierrah Thurik had two singles and an RBI for Beaver Local. Morgan Bouscher also had two hits. Beaver Local lost the second game 9-6. Thurik led the Beavers with three doubles and two RBIs. Beaver Local (5-7) is at Oak Glen Tuesday. BE–Natalie Stoner, wp, (7IP, 7K, 1BB) and Courtney Ault. BL–Cierrah Thurik, lp, (7IP, 4K, 1BB) and Tori Bowersock. BE–Natalie Stoner, wp, (7IP, 4K, 3BB) and Courtney Ault. BL–Olivia Keller, lp, (5IP, 3K, 4BB), Cierrah Thurik (2IP, 3K, 0BB) and Lexi Schrieber.